TS Police Constable 16925 Posts Apply Online Application Form at www.tslprb.in : Telangana Police Posts Recruitment 2018 Online Apply for 16,925 Vacancies at www.tslprb.in.Telangana Police constable Online Application Form 2018 How to Apply Online Application Official website. The Telangana State Level Police Recruitment Board (TSLPRB) invites Applications through ONLINE mode only in the prescribed proforma which will be made available on Website (www.tslprb.in) from 09-06-2018 to 30-06-2018 for recruitment to the following Posts. Telangana TSLPRB Police Recruitment Board 16,925 Vacancies TS Police Constable Recruitment 2018 Telangana Police recruitment notification 2018 TS police constable vacancies 2018-19, Police jobs in Telangana 2018,Telangana police online application TS Police Constable Recruitment 2018. Telangan Police Civil Constables Post Online Application and AR Constables Post Online Application CPL Constables Constable Post Online Application TSSP Constables Constable Post Online Application SPF Constables Post Online Application Firemen Constables Post Online Application. 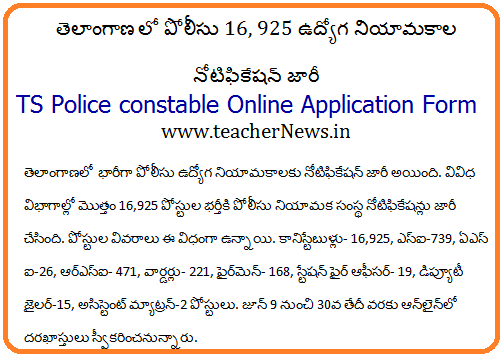 TS Police Posts 2018 Online Apply for 16,925 Vacancies at www.tslprb.in. Telangana Police SI, Constable & ASI Recruitment 2018 – 16,925 Posts Apply Now Telangana Police Recruitment 2018 – Apply Online for SI, Constable & ASI Posts Telangana State Level Police Recruitment Board (TSLPRB) (Telangana Police) has advertised a notification for the recruitment of 16,925 posts of SI, Constable & ASI vacancies. Eligible candidates can apply online from 09-06-2018. Candidates with local status of Telangana belonging to OCs and BCs applying for the Posts of SCT PC (Civil / AR / SAR CPL / TSSP), Constables in SPF, Firemen in TS Disaster Response & Fire Services Department and Warders (Male) / Warders (Female) in Prisons & Correctional Services Department have to pay a fee of Rs.800/- towards Registration of the Application, Processing of Application, Conduct of Tests and Examinations, Maintenance of Portal etc., Local Candidates of Telangana belonging to SCs and STs have to however, pay only Rs.400/- towards the same. All other Candidates will have to pay Rs.800/-. Fee may be paid at TS Online / AP Online / MeeSeva (e-Seva) Centres / through Payment Gateway (Credit Card / Debit Card / Internet Banking). Telangana Police Posts Recruitment 2018 Online Apply for 16,925 Vacancies at www.tslprb.in. TSLPRB Police Recruitment Notification Online Apply details download.